Follow the latest news, highlights, upsets, scores and more with SI's writers and editors in Saturday's March Madness action. Stay on this page for all the latest NCAA tournament news, scores, highlights and upsets from Saturday. Get all of Greg Bishop’s columns as soon as they’re published. Download the new Sports Illustrated app (iOS or Android) and personalize your experience by following your favorite teams and SI writers. SPOKANE — Friday in the NCAA tournament was madness. Friday featured a half-court game-winner that was sunk just before the final buzzer for Northern Iowa to topple Texas. And Friday supplied a dunk from Cincinnati that would have tied Saint Joseph’s but was slammed milliseconds after the final horn. Friday produced upsets from a 15-seed (Middle Tennessee), a 14 (Stephen F. Austin), a 13 (Hawaii), an 11 (Northern Iowa) and two 10s (VCU and Syracuse). It seemed like the NCAA tournament might continue this way until a champion is crowned in Houston at NRG Stadium on April 4. That’s because of how the 2015–16 college basketball season unfolded, in a fashion best described as chaotic and uneven, leaving few clear favorites—many of which are flawed. One of those darlings, Michigan State, fell to Middle Tennessee, seemingly confirming the wobbly state of the field. That also happened Friday. Naturally. Then the Saturday games tipped off, and Saturday wasn’t madness. Saturday was calm. Saturday was chalk. O.K., so a No. 11 in Gonzaga destroyed a No. 3 in Utah, leaving the Pac-12 with only Oregon remaining from among the seven teams the league sent to the tournament. And Indiana, seeded fifth in the East region, did down a presumed contender in Kentucky, but the Wildcats were seeded fourth. Saturday, the tournament waved goodbye to a trio of Cinderella hopefuls in Arkansas-Little Rock, Wichita State and Yale. While the Trojans were beaten handily by Iowa State in the Midwest Region, the Shockers and Bulldogs, both playing in Providence, fell behind by more than 20 points before mounting impressive comebacks but ultimately losing to Miami and Duke, respectively. Saturday saw three No. 1 seeds advance in Kansas, North Carolina and Virginia. Those who expected the unexpected got the opposite on Saturday. 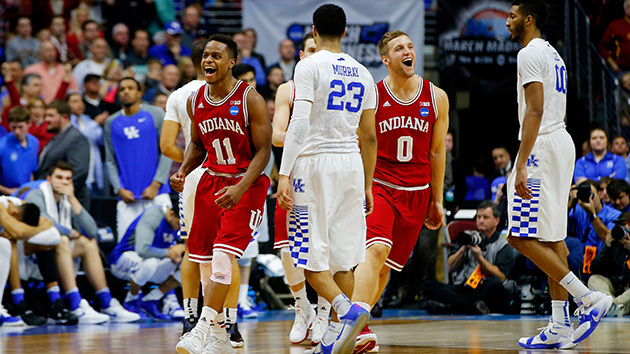 But they did get a noteworthy surprise—Indiana’s victory over Kentucky—with significant implications. It felt, according to those in attendance in Des Moines, more like a Final Four game than a second-round contest, with the Wildcats and their eight national championships going against the Hoosiers and their five titles. The power programs, universities located on opposite sides of the Ohio River in neighboring states, had played at least once every season from 1969 to 2012. John Calipari, the Kentucky coach, was charged in some quarters for ending the series four years ago over a disagreement as to where any future games should be played, and the schools have been unable to work out a solution. They cannot avoid each other in the tournament, though, where they last met in the Sweet 16 in 2012. The Wildcats won that game en route to their most recent national title. They did not win this one. 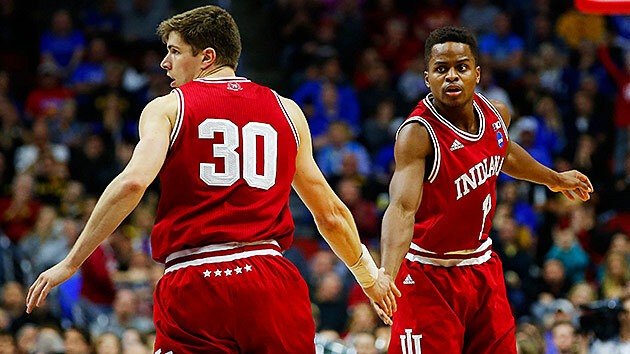 Indiana freshman center Thomas Bryant scored 19 points and senior point guard Yogi Ferrell added of 18 of his own. 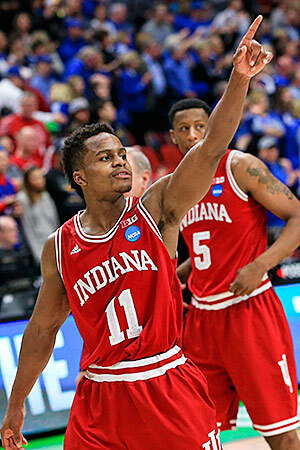 The Hoosiers made 13 of 24 shots in the second half, and Bryant sealed the 73–67 victory by making two free throws with 10.4 seconds left. 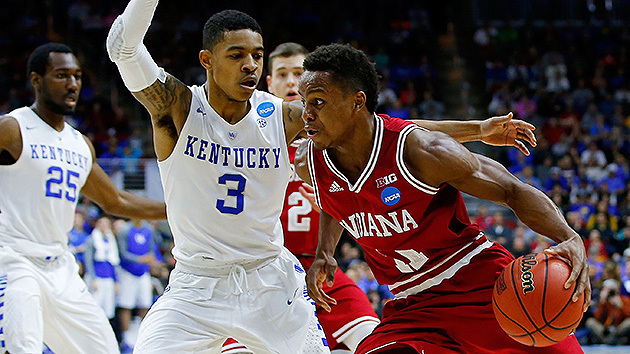 Aside from a one-and-done NIT trip in 2013, this was Kentucky’s earliest exit from the postseason since Calipari’s arrival before the 2009–10 season, and it marked the first time the Hoosiers had beaten the Wildcats in the tournament since 1973. The history, the rivalry, the cancellation of the series, and the fact that Indiana coach Tom Crean had critics calling for his job this season, combined for a win that meant more than most second-round wins mean. But it did matter. Of course it did. 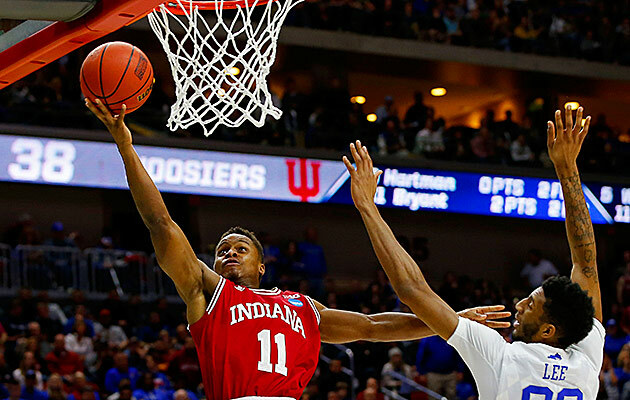 It put the Hoosiers in the second week, although the East region, with top-seeded North Carolina and second-seeded Xavier still alive, is one portion of the bracket that hasn’t been busted much. Yet, anyway. Early Saturday, two ACC power programs in Duke and Miami nearly joined the brigade of teams that suffered upsets. The Blue Devils, in a contest of future world leaders, stretched their lead over Yale to 27 points, only to watch the Ivy League champion claw its way back. Late in the second half the Bulldogs trimmed the Blue Devils’ advantage to three points, as one of their fans, clad in a Santa Claus hat, provided a national television audience with a double-barreled middle-finger salute. So Saturday also gave us the Yale Santa Middle Finger Guy. Duke survived what coach Mike Krzyzewski expected—that his inexperienced team would lose focus with that large of a lead—because he deployed a 1-3-1 zone in the second half. That zone slowed Yale just enough. 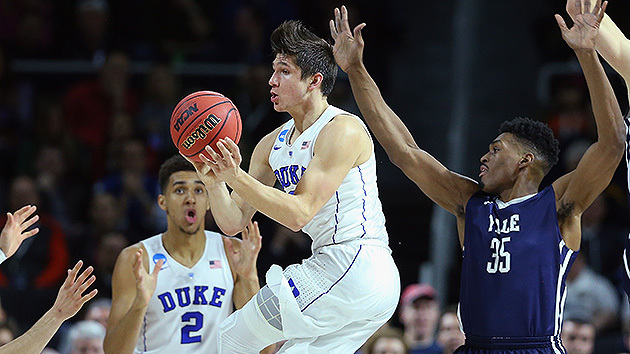 Sophomore guard Grayson Allen’s performance embodied Duke’s on Saturday. He scored 22 points in the first half—and seven in the second. 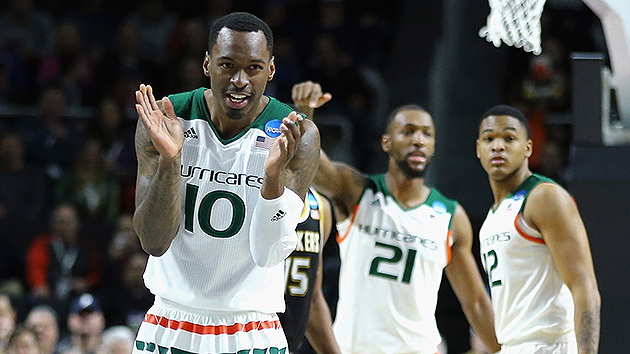 The Hurricanes fans countered with shouts of “Sweet 16!” as the final seconds ticked away. They’ll be joined by yet another ACC team in Virginia, which bested ninth-seeded Butler, 77–69, in the Midwest Regional. And by Iowa State, which battered Little Rock, 78–61, to set up a meeting with the top-seeded Cavaliers next week in Chicago. Senior forward Georges Niang scored 28 points and snagged six rebounds for the Cyclones, same as he did against Iona in the first round. He had perhaps the most impressive first week of the tournament for any single player. The final day of the first week of this NCAA tournament tips off Sunday, with eight more games that will decide which teams round out the regional semifinals. What Friday and Saturday taught us was to not only expect the unexpected but that it’s O.K. to sometimes expect the expected, too. That’s worth a Santa hat and two middle fingers, easy. It had been, in the word’s truest definition, an awesome performance. The Blue Raiders had pushed repeatedly into the teeth of the Spartans’ defense, then buried it with bombs launched from beyond the arc. They had stymied the potential national player of the year, Michigan State point guard Denzel Valentine, with a revolving array of defensive schemes (switching among man-to-man, 1-3-1 and 2-3 zones), and grabbed nearly a third of their misses against the nation’s eighth-best defensive rebounding team. “We got beat by a team that played better than us today,” Spartans coach Tom Izzo, a current Hall of Fame finalist, told reporters after. 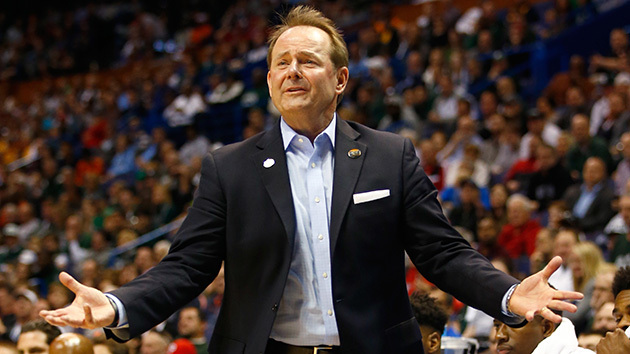 His counterpart, Middle Tennessee coach Kermit Davis Jr., was kept so long by post-game TV and radio appearances that the bus ended up leaving the Scottrade Center without him. The Blue Raiders enter Sunday’s game against Syracuse as the unlikeliest second-round party crashers in a tournament that has been overrun by them. They will again oppose an elite coach (Jim Boeheim, inducted in the Hall of Fame in 2006), a vaunted and difficult defense (Boeheim’s signature 2-3 zone), and a name-brand program easily cast as one of March’s Goliaths. (That this year’s Orange team is seeded 10th and has lost 13 games will do little to dissuade that perception.) Middle Tennessee snuck up on Michigan State and the rest of America as a collection of directional-school unknowns with a clunky moniker (the full run-on: Middle Tennessee State University Blue Raiders) from an institution whose most famous alumni include Al Gore's father and one of the singers from the country band Lady Antebellum. Friday’s win was the school's first in the NCAA tournament in 27 years and the fifth ever for a program that has produced just two NBA players—Warren Kidd and Duane Washington—who combined to play 87 games in the late 1980s and early ‘90s. That belief in themselves “all starts with coach,” said Jarrod Lazarus, the team’s director of operations. Davis too had an enticing backstory, having risen to become Idaho’s head coach at age 28 and taken the Vandals to consecutive NCAA tournaments in his first two seasons. He left to take over at Texas A&M in 1990, then went 8-21 and resigned after the Aggies were found to have committed NCAA violations by providing benefits to a recruit from, of all places, Syracuse. “I made some mistakes there,” he said Saturday of his time in College Station. “We kind of had to recycle our career.” The process began with an assistant job at Chipola (Junior) College, then continued with another at Utah State, the head job again at Idaho for one season, and five years under his good friend John Brady, who was then the coach at LSU. In 2002 his climb back up the coaching rungs reached Middle Tennessee, where he has been since. He could be forgiven for the feeling. Middle Tennessee Mania had gripped the St. Louis sub-regional, providing insatiable fodder for the reporters who drive a site’s off-day media conversations. (See: this story.) On Thursday, during the Blue Raiders’ availability on the eve of their first game, their locker room was so devoid of outsiders that when a reporter (and always a reporter) spoke with a player many of his teammates looked on, rapt. In Saturday’s session multiple players held court with more than one interviewer at a time, their faces alit by TV cameras. After a close first half, No. 1 North Carolina broke away in the second to defeat No. 9 Providence, 85–66, and advance to the Sweet 16 in the East. Senior forward (and current SI cover man) Brice Johnson led the way for the Tar Heels, scoring 21 points and grabbing 10 rebounds. It was his 21st double double of the season. Senior guard Marcus Paige heated up in the second half and scored 12 points, while adding three rebounds, and the Tar Heels starters combined for 65 points. For the Friars, star junior guard Kris Dunn led the way with 29 points and shot 62.5% from the field, while sophomore forward Ben Bentil, the Big East’s leading scorer, added 21 before fouling out with just under eight minutes left. North Carolina defeated a tough Providence team filled with NBA talent and made it look easy. National Player of the Year candidate Johnson is averaging 19.5 points in the tournament and has been an absolute difference maker on defense (17 rebounds in two games). The Heels also won this game without a significant performance from key junior forward Kennedy Meeks, who scored only two points. With Johnson, the best two-way defender in the tournament, a steady point guard in Paige and one of the best coaches in the game, North Carolina has proven why it’s a favorite to win it all. On March 25th in Philadelphia, North Carolina will take on No. 5 Indiana. The Hoosiers beat No. 4 Kentucky, 73–67, earlier Saturday. The UNC-Indiana game will feature the fifth- and seventh-most efficient offensives, respectively, per kenpom.com. Get all of Madison Hartman’s columns as soon as they’re published. Download the new Sports Illustrated app (iOS or Android) and personalize your experience by following your favorite teams and SI writers. Gonzaga dominated the first half and never looked back, led by Domantas Sabonis (19 points, 10 rebounds) and Kyle Wiltjer (17 points). Wiltjer went 3 of 4 from beyond the arc and Sabonis dominated the boards on both ends of the court to finish with a double double. Eric McClellan got hot in the final six minutes of the first half when he hit two threes and finished with a game-high 22 points. Utah’s Jakob Poeltl had only five points and two rebounds in the first 20 minutes, spending much of the time on the bench after two early fouls. Kyle Kuzma, who averages just 10 points per game, kept the Utes in the game with three three-pointers of his own and finished with a team-high 15 points. Nine Utah turnovers led to 15 points for the Zags and a 44–29 lead heading into the locker room. In the second half the Bulldogs quickly pushed the lead to 20, shooting an astounding 60% from the floor. Utah, meanwhile, never found its footing, turning the ball over a total of 13 times. SI All-America Poeltl went scoreless in the second half. Never underestimate the Zags in March. As Gonzaga moves on to face another high seed, it has a real shot at going even deeper in the tournament, and with monster nights from Wiltjer, Sabonis and McClellen, the Bulldogs look unstoppable. The Zags will face the winner of No. 10 Syracuse vs. No. 15 Middle Tennessee on Friday in Chicago. To the addictive and casual basketball fan alike, the narrative was ripe for an upset. A matchup between Kansas, the overachieving, ultra-talented regular season that underachieves in the postseason against UConn, the underachieving regular-season squad that has two national championships to its name over the past five years. Then the Jayhawks ran out to an 18–5 lead. Then they held UConn scoreless for over six minutes to build a 24-point lead. The narrative was over before the end of the half. The Jayhawks blitzed the Huskies for a 73–61 win on Saturday night, solidifying their role as the favorites to win the tournament after the unlikely departure of Michigan State. The Jayhawks held UConn to 26% from the field in the first half despite the Huskies making five of their 10 three-point attempts, and Perry Ellis overcame an early cramp to finish with 21 points and eight rebounds. Wayne Selden Jr. contributed 22 points in a game that wasn’t particularly close from the start. The Jayhawks are known for their untimely exits from the tournament, but after their 16th consecutive victory (and one in completely dominant form), they should be considered the outright favorite for the national title. Bill Self’s squad features a balance of perimeter threats and inside-out play to keep any team off-balance. Selden Jr.’s exceptional play from the perimeter coupled with Ellis’s versatility will cause problems for any team facing the Jayhawks in the coming rounds, and their destruction of the Huskies may just be the beginning. Kansas will take on the winner of Sunday’s matchup between Maryland and Hawaii in Spokane. The winner will meet the Jayhawks next week in Louisville. Butler made a valiant effort to add to its impressive collection of NCAA tournament upset victories in its second-round matchup against No. 1 seed Virginia on Saturday, but the Cavaliers were resilient and put on an offensive clinic in the second half. Virginia was 19 of 26 from the field (73.1%) after halftime and scored a season-high 54 points in the half en route to a 77–69 win. Senior guard Malcolm Brogdon scored a team-high 22 points, including the game’s final four points at the free throw line, to go along with five assists and four rebounds. Butler forward Andrew Chrabascz scored 12 of his game-high 25 points in the first half as the Bulldogs took a 25–23 lead into halftime. Both teams traded baskets for the first 20 minutes as Butler stretched its largest lead of the half to three points, but no further. Virginia scored the first six points of the second half but Butler countered with a 14–5 run fueled by three three-pointers, a layup and a free throw from Chrabascz. Butler fifth-year senior Roosevelt Jones scored 17 points in the second half and carried the Bulldogs down the stretch. After first-half turnover issues, Virginia took care of the ball in the second half, posted a plus-six rebounding advantage and found secondary scoring options off the bench en route to a Sweet 16 berth. Virginia’s second-round win improved the ACC to 9–1 in the NCAA tournament, with three teams having already advanced to the Sweet 16. The Cavaliers haven’t advanced past the Sweet 16 under head coach Tony Bennett but they’ll look to make their best tournament run since going to the Elite Eight in 1995. Malcolm Brodgon’s big performance reaffirmed his status as one of the best college basketball players in the country and a Virginia star who will go down in Cavalier lore. 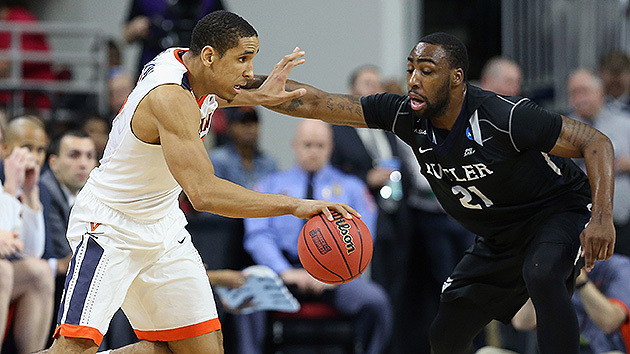 Butler finished the season 22–10 but was just 11–9 in this calendar year. The Bulldogs put a scare in the Cavaliers as they tried to send the first No. 1 seed home in this year’s tournament but they came up short, ending the careers of Roosevelt Jones, Kellen Dunham, Austin Etherington and Jordan Gathers in the second round of the NCAA tournament. Ever since No. 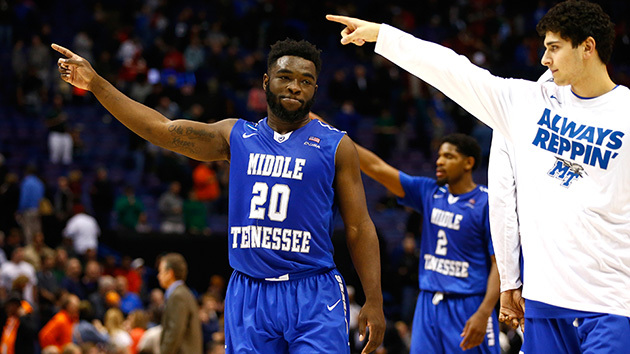 15 seed Middle Tennessee upset No. 2 seed Michigan State on Friday, the Midwest Region became Virginia’s to lose. The Spartans sent the Cavaliers home in the last two NCAA tournaments, so Middle Tennessee’s upset certainly made Virginia’s path to Houston more favorable. The Cavaliers will face No. 4 seed Iowa State and the country’s third-most efficient offense in the Sweet 16. In the first half of Sunday’s West Regional second round game, Duke looked every bit the power conference heavyweight that it is, using a 34–6 run to take a 27–point lead over Ivy League champion Yale, fresh off its first ever NCAA tournament win. The fourth-seeded Blue Devils still led by 22 at intermission. But in the second half, the 12th-seeded Bulldogs bit back, dominating the glass and outscoring the defending national champions 15–0 to get within seven with 11 minutes remaining. They eventually got within three in the final minute, but Duke made just enough free throws down the stretch to hold on for a 71–64 win that sends the Blue Devils to the Sweet 16. 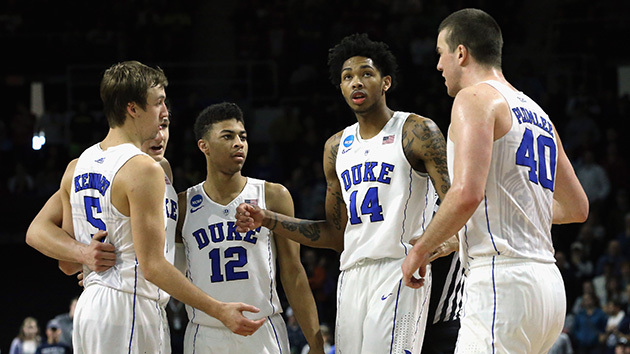 For the second straight game, Duke got a battle from a double-digit seed. After trailing by as many as six points in Thursday’s first-round game to No. 13 UNC Wilmington, when they didn’t put the game away until the final minute before winning by eight, the Blue Devils appeared to be on cruise control against Yale. Instead, they instead had to battle to avoid one of the biggest collapses in NCAA tournament history. With the increased quality of competition they’ll face from here on out, they will have to play well for 40 minutes if they expect to reach another Final Four. The good news for Duke is that after making just 4 of 15 from three-point range against the Seahawks, Mike Krzyzewski’s team made 10 of 18 in the first half on Sunday. When the Blue Devils shoot like that they are extremely tough to beat. That’s even more true when both Ingram (25 points) and sophomore guard Grayson Allen (29 points) are playing well, as they did in combining for 54 points against the Bulldogs. Duke faces the winner of Sunday’s game between No. 1 Oregon and No. 8 Saint Joseph’s in the Sweet 16 next Thursday in Anaheim, Calif.